Kotondo, Torii (1900 - 1976), "Rouge"
Notes: RARE; Ikeda published design - A trial or printer's edition. Born Saito Akira in Tokyo, at the age of 15, Torii Kotondo became the adopted son of Torii Kiyotada. Kiyotada was the seventh generation head of the well known Torii family of print designers, and Kotondo assisted him with the production of Kabuki posters and billboards. He studied the techniques of Yamato-e painting and contributed woodcuts and illustrations for Entertainment Illustrated Magazine (Engei Gako). 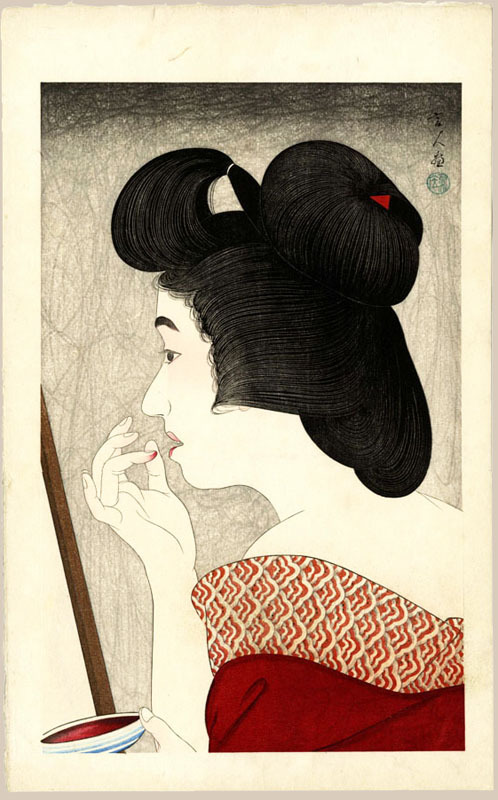 In 1917, Kotondo entered the studio of Kaburagi Kiyokata where he met Shinsui and Hasui. During the next few years he developed his style of bijinga. Kotondo designed most of his moku-hanga in 1927-1933, which were published by Sakai and Kawaguchi, Ikeda and two by Kawaguchi alone. All of his 21 bijin-ga are signed "Kotondo".